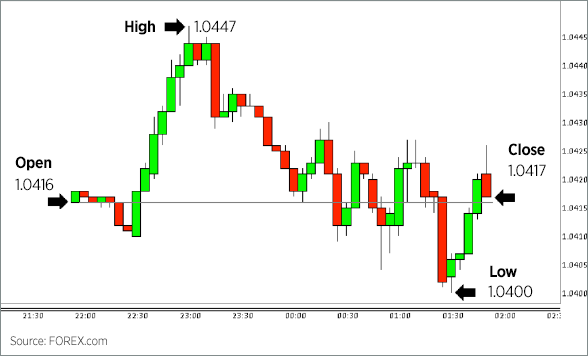 Considered a neutral formation suggesting indecision between buyers and sellers–bullish or bearish bias depends on previous price swing, or trend. 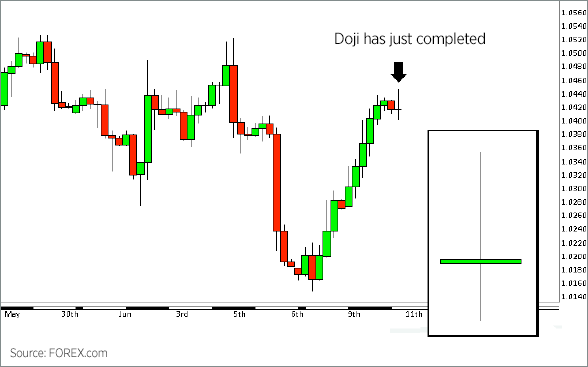 So how do I use doji’s to place trades? Doji are neutral indicators that simply represent a “tie” in the never-ending battle between buyers (bulls) and sellers (bears). On their own, doji are not much help in making sound, high probability trading decisions— as is the case with any single indicator. This is mainly due to the fact that even if a doji does signal the beginning of a price swing reversal, it will not give any indication as to how far the reversal my go or how long it may last. 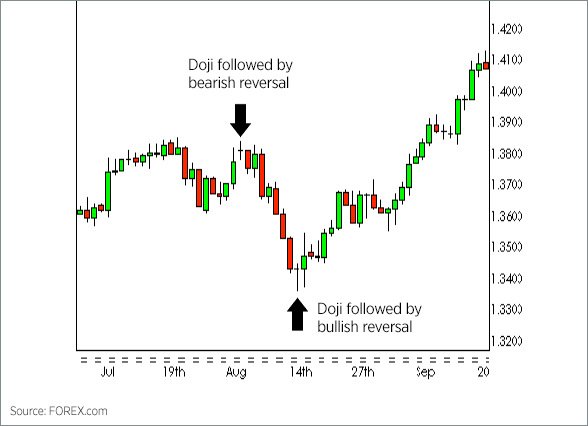 Let’s take a look at how doji can be used with other basic technical indicators to make a high probability trading decision. 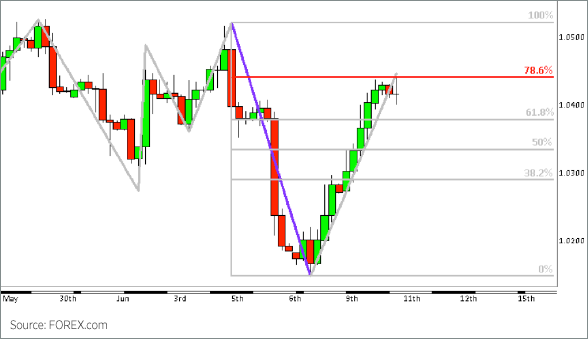 The first things we want to do is determine support & resistance, and trend. The idea is to sell near resistance, and buy near support. Trend helps tell a trader which direction to enter, and which to exit. (enter the market shot with a sell order, or enter the market long with a buy order), and which to exit. 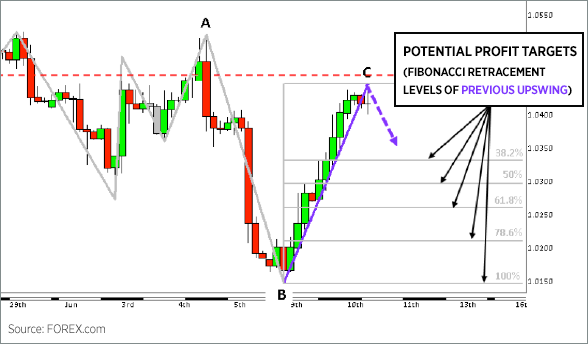 In the above example, we see the completed doji (point C) has also occurred at the 78.6% Fibonacci retracement level of resistance based on the previous downtrend. In other words, the swing from the low up to the completed doji (B-to-C) is approximately 78.6% of the previous downtrend (A-to-B). 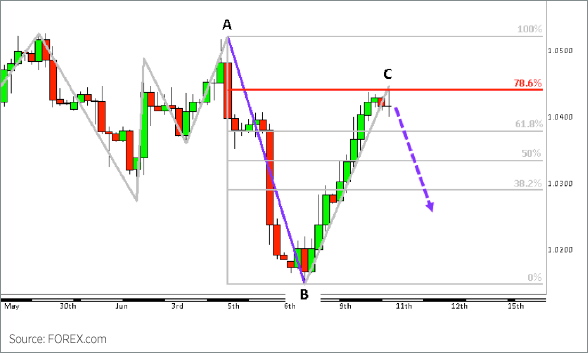 In this case, a trader may interpret this doji as confirmation of the Fibonacci resistance and in turn anticipate an forthcoming reversal, or downswing. If the doji fails (a new high is make above the high of the doji), then this would negate the reversal and suggest a potential continuation. 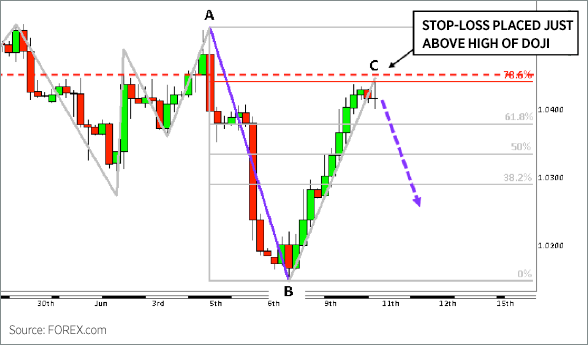 Based on this basic idea, a trader may then decide to enter the market short (place a sell order) with a stop (or sometimes referred to as a stop-loss) placed above the high of the doji and the Fibonacci level of resistance. 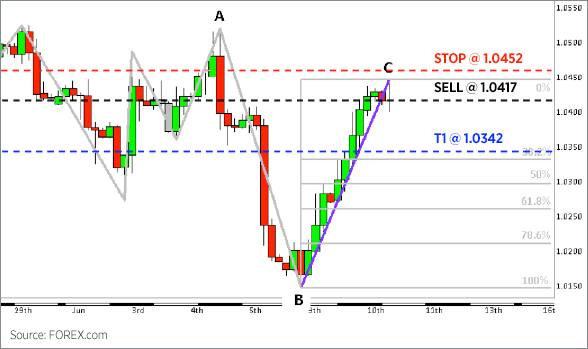 Since this stop-loss order is meant to close-out a sell entry order, then a stop buy order must be place. What is very important to remember is that the highs, lows, opens and closes seen on a price chart reflect the bid prices of that particular market— in other words, the price at which a trader may sell. When placing a buy order it is extremely important to account for the spread for that particular market because the buy (ask) price is always slightly higher than the sell (bid) price. 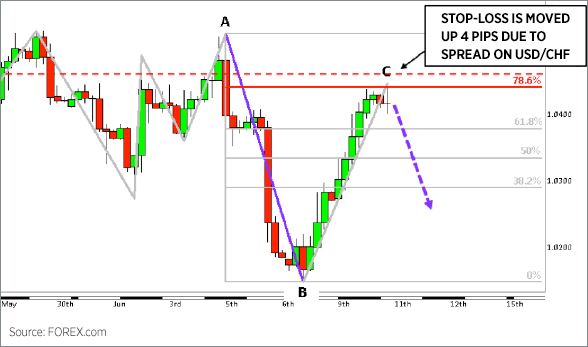 In this example, let’s assume the spread on the USD/CHF at the time of this trade is 4 pips. 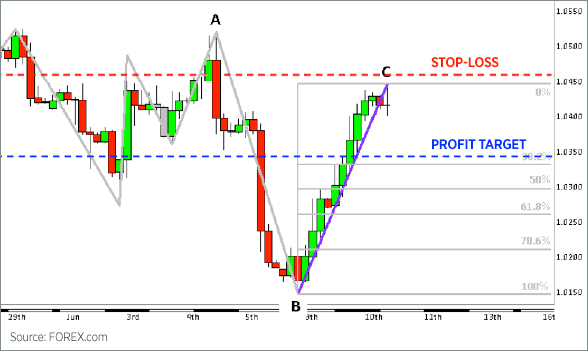 In order to close the short, or sell, entry order the trader must place a buy order to either control the amount the trader is willing to lose with a stop-loss, or where to take profit with a limit order (or multiple limit orders if multiple profits targets are established). 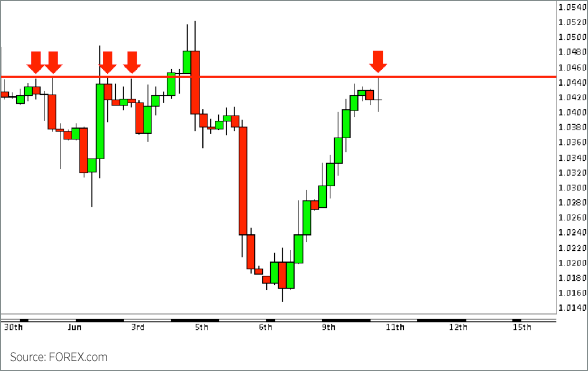 The size of each stop or limit order is based on the size of the entry order, or what is referred to as the traders open position. 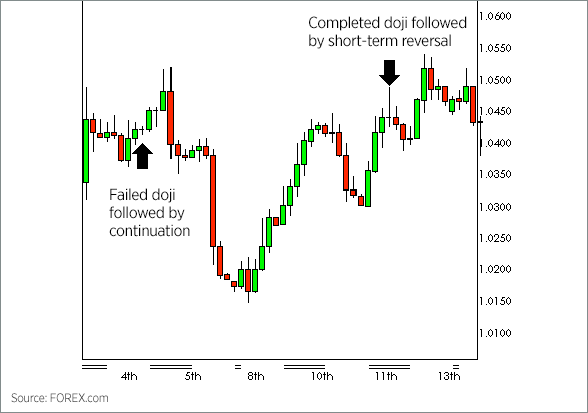 Although it is not uncommon for traders to have multiple profit targets, it is generally good practice to have one stop order that matches the size of the total open position thus taking the trader completely out of that position. No one no matter how experienced a trader, no one knows with any degree of certainty what the market will do next or how far the market will go. This explains why some traders may choose to have multiple profit targets. One age old trading mantra says, “cut your losses quickly, and let your profits run.” Although this, for good reason, is an excellent piece of advice it is often misinterpreted by both new and veteran traders alike. A trader must “let profits run” only to logical profit objects, which generally reflect levels of support and resistance. This is where trend analysis, plays a significant role in helping to determine which profit targets, or how many, a specific trade calls for. The mistake for most traders is not wanting to “get out too early” and as a consequence greed oftentimes takes over. This almost always leads to giving those profits back, and in many cases turning a winning trade into a losing trade. Multiple profit targets tend to lead to more complicated exit strategies in which stop management becomes essential. One key aspect of successful trading that will help to determine the quality and probability of a trade is the risk vs. reward ratio. In my opinion, this is without question the single most important factor of a high quality trade. 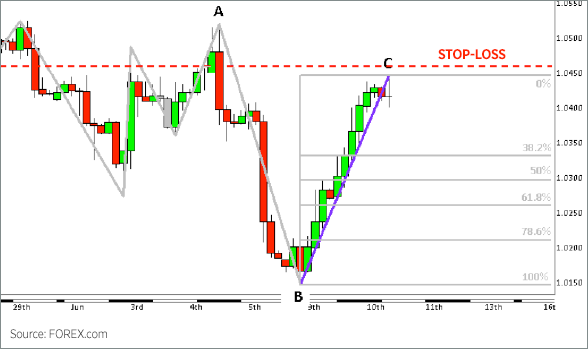 For now, let’s just keep it simple and see what this trade setup looks like using the same USD/CHF example. 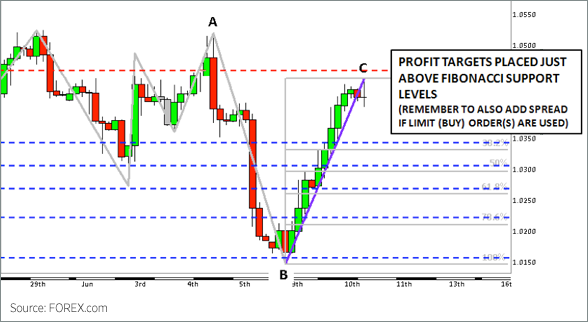 We will assume the most conservative profit target (set just above the 38.2% Fibonacci retracement level adding 4 pips for the spread). Now that we have determined out exits BEFORE entering into the market, we will be able to perform the 2 absolutely essential/crucial components of proper risk/money management, and trading in general. Depending on exactly where we enter the market we are able to determine 1) the risk vs. reward ratio, and 2) the amount of risk on the trade. The risk vs. reward ratio in many cases will be the determining factor based on a traders’ winning percentage. The risk itself will help determine the appropriate size trade to place. 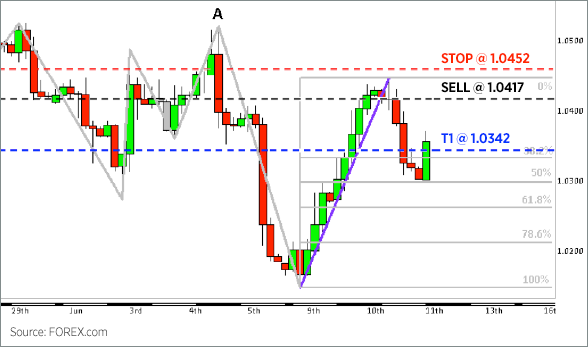 Let’s assume we entered this short trade just after the doji completed, the sop-loss order was placed 1 pip above the high of the completed doji adding 4 pips for the spread, and the limit order was placed 5 pips above the first profit target, or T1 (just above 38.2% retracement of B-to-C, plus the 4 pip spread). 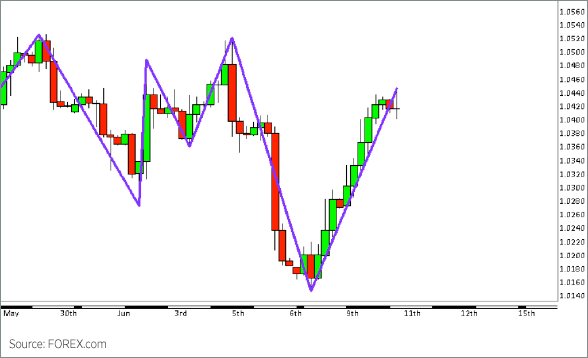 In this scenario, the trader has two options…. This particular trade resulted in a win for a total of $360 USD. Obviously, this is just one example and in no way suggests or constitutes a standalone trading strategy or methodology. However, the real point here is that profitable trading is not about complex indicators or systems. Above all is good risk and money management. If a trader was disciplined enough to only take trades that offer maximum risk to reward ratio, then it’s easy to see that profitable trading is not about being right, it’s about discipline and ability to control your emotions. This example demonstrated an opportunity with just over a 1:2 risk vs. reward ratio. If that ratio was one of a traders minimum criteria for placing a trade, then that trader would only need to maintain a 33% winning ratio to break even in terms of profitability. Even when losing, or being “wrong”, happens more frequently than winning, or being “right,” a trader can be profitable. Understanding this in and of itself gives you and edge or advantage against a majority of traders out there. Let go of you ego, play the numbers game, and you have a good chance of reaching your goals. The market may turn at these at these predetermined logical profit targets, or in many cases move way beyond them. A trader will never know this information in advance. What tends to happen in the instances where the market continues to move in a profitable direction after the trader has already closed the trade for profit, the “shoulda, coulda, woulda’s” start to take hole, and greed starts to blind the trader to the truth. The truth is, you made a PROFIT!. But when the market continues to move in a profitable direction after the trade has been closed, most traders will no longer look at that trade and think, “who cares! I made money on the trade, and I’m happy with that.” Most traders forget about the profit they’ve taken and start to think, “Damn! I got out too early! Look at how much I could have made, or should be making.” This leads to emotions. Emotions lead to irrational, illogical decisions—especially when money is in the equation. Over time, making trading decisions based on emotion leads to trading suicide (i.e. a zero balance). Having a high winning percentage means nothing if you lose your shirt when you’re wrong. A 80% win ratio combined with a 1:4 risk-to-reward ratio results in a trader being “break-even” over an extended period of time in terms of your overall account balance. Whereas a trader with only a 33% win ratio will have “break-even” results while maintaining a 2:1 risk-to-reward ratio. Most traders do not follow the same rules, if any, each and every time they place a trade. Most place several trades, and then “try” something else. Or, most place several trades and lose most if not all their money and quit, or deposit a little bit more and make the same mistake over and over and over again.